Corvallis, Ore. – Career aspirations for six Oregon State University Fermentation Science students received a boost from brewing industry advocates last Friday night. Each student was awarded a Jack Joyce Scholarship for a combined total of $60,000 distributed among the winners. The scholarship, established by Columbia Distributing and Rogue Ales as a tribute to Rogue Founder Jack Joyce, has given away $245,000 in four years. Each year the scholarships are built from generous donations from influential organizations in the beer industry. This year’s partners included Hop Valley Brewing, Crux Fermentation Project, Coleman Agriculture, National Beer Wholesalers Association, Fremont Brewing Company, 2 Towns Ciderhouse, Tri-S, John I. Hass, Gopher Kegs, Ss Brewtech, the Beer Institute, Great Western Malting Co., KG Specialties, Saxco International LLC, Indie Hops LLC, Georgia-Pacific, Umpqua Bank and the Rogue Foundation. Click here for more photos from the Jack Joyce Scholarship Award Ceremony. 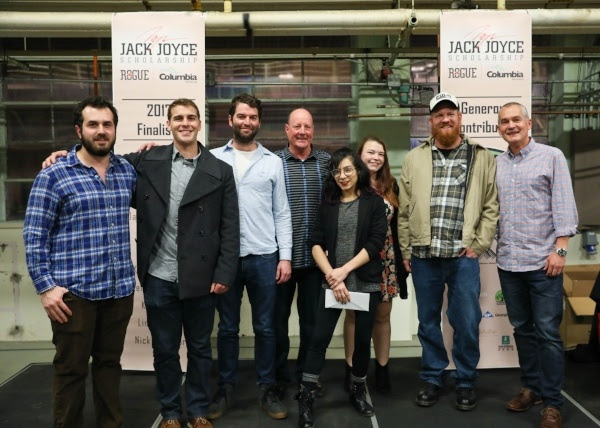 About the Jack Joyce Scholarship: The Jack Joyce Scholarship Award was created in 2014 by Columbia Distributing and Rogue Ales in honor of visionary Jack Joyce for his legacy in the Oregon community and his founding of Rogue Brewery in 1988. Jack’s vision, creativity and innovation led Rogue to take daring risks that have created one of the most successful breweries and distillers in the nation. Each year students enrolled in Oregon State University’s Fermentation Science program can apply for scholarship funds. For more information on the program, please visit http://www.coldist.com/community/jack-joyce-scholarship/. About Rogue Ales: Rogue Ales is an agri-fermenter founded in Oregon in 1988 as one of America’s first microbreweries. Rogue has won more than 1,800 awards for taste, quality and packaging and is available in all 50 states as well as 54 countries. Since 2008, Rogue has remained committed to saving the terroir of Oregon hops, barley, rye, wheat, honey, marionberries and pumpkins one acre at a time, by growing its own. For more information on Rogue, please visit www.rogue.com. About Columbia Distributing: Columbia Distributing is one of the nation’s finest beer, cider and non-alcoholic beverage distributors. Headquartered in Portland, Oregon, the company has distributed some of the best-known brands in the beverage business since 1935. Today Columbia Distributing and its 2,500+ employees service over 20,000 retail customers covering more than 135,000 square miles in Oregon, Washington and California. The company’s success is based on the deep-rooted tradition of delivering quality products, timely service and a genuine concern for customers’ needs. This is achieved by providing ongoing, sustainable opportunities and growth for its employees, customers, suppliers, shareholders and communities. For more information on Columbia Distributing, please visit www.coldist.com.